The next day there was a wedding celebration in the village of Cana in Galilee. Jesus' mother was there, and Jesus and his disciples were also invited to the celebration. While we sometimes forget it or even doubt it, God is always present. He joins us in our everyday lives and accompanies us on all of our daily wanderings. He is with us every step of the way. 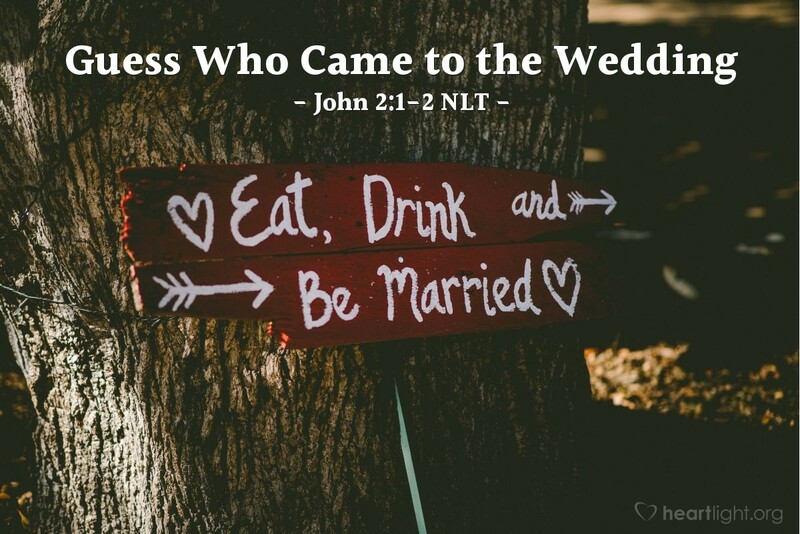 Jesus reminds us of this truth in his ministry when he goes to fancy events at important times and also when he meets the most forgotten people in the most out-of-the-way places. John wants us to know that Jesus joins in the highs and lows of all of life to get us to the ultimate high: to show us the glory of God and bring us home to our heavenly Father. We shouldn't be surprised that Jesus and his disciples made an appearance at a local wedding. Jesus enters all of life to enjoy it, to bless it, to help us find God, and to give us a little taste of heaven's glory. Father, please help me see your presence in the things that I do. Give others a glimpse of your glory as I seek to live the Christian life before the people in my world. I boldly trust, O God, that you are close by, even on those days when I cannot sense your nearness. I believe, dear Father, but in my moments of struggle, please strengthen my faith. In Jesus' name. Amen.